Think acne is just a problem that women deal with? Think again. The truth is guys struggle with breakouts just the same as women. And while some guys say they don’t care, we know the truth: looking your best when going out matters to men as well. Confidence is attractive – so get confident about your skin and appearance with nine sure-fire ways to help you banish breakouts for good. 1. Nothing else is going to help if your face isn’t clean: Let’s get real for a second: your face is constantly bombarded with impurities from your hands, the environment, dead skin cells, oils, and more. Most acne comes from the clogging of pores, and the simplest way to combat this is to keep your face free of the debris and impurities that can lead to clogged pores. Even if your acne is caused by deeper issues, cleaner skin can help minimize breakouts. When washing, it’s important to not over wash and damage the skin. Guys think they need to scrub hard – and while this may be true for dirty hands after a long day’s work, the skin on your face and neck doesn’t need such vigorous cleaning. Wash gently with warm water; you can even use an exfoliating loofah or glove. Always rinse away any excess soap and dry your face with a clean towel when finished. Check out our guide on cleansing. It covers everything you need to keep your skin fresh and clean. 2. Try over-the-counter acne treatments: You may have avoided acne products because you didn’t want to talk to a doctor about it or get a prescription. There’s good news: tons of effective acne treatment options are on the shelf at your local department store. But be careful, a lot of active acne fighting ingredients; like salicylic acid, benzoyl peroxide, lactic acid, and glycolic acid; can dry or damage your skin. You’ll want to start with a small amount to see how your skin reacts. Additionally, you’ll need to start moisturizing your skin, which is next on the list. 3. Start moisturizing: Nearly all products that treat acne also dry your skin. You’ll need to use a moisturizer to rehydrate your skin, keeping it from drying out and flaking. This looks bad and leads to sensitive, irritated skin. It’s important to look for a moisturizer that is “noncomedogenic,” which means it is unlikely to cause acne which some moisturizers can do. We also have a guide on moisturizing with everything you need to know to keep your skin hydrated. 4. Keep up your exercise routine: Exercise is great for your skin just like any other part of your body. Exercise helps stretch the skin to keep it supple and elastic. It also makes you sweat which gives your skin a chance to purge toxins from your system. Of course, you’ll need to change out of your exercise clothes and clean off for your skin. The oils trapped in your clothes from the sweat my actually irritate and cause breakouts if you continue to wear them after exercising. This is a good time to cleanse your face as well, which we covered in tip #1. 5. Stop touching your face: This one sounds easier than it is. The reality is the more you touch your face, the greater chance you have to clog pores and irritate skin with whatever is on your hands. Your hands touch everything, and they have thick, rugged skin that repels dirt and grime. The same isn’t true for your face, so protect it from everything your hands touch by avoiding facial contact. You should also be washing your hands regularly so that when those idle touches happen, the exposure is minimized. 6. 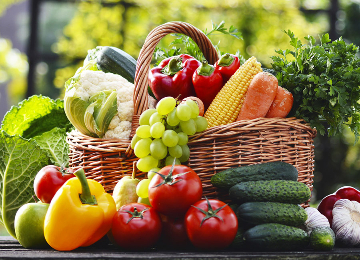 Enjoy a skin-healthy diet: There’s a lot of different research out there on this one. Some research claims certain fruits and vegetables as “super foods” that can cure acne. While the truth of some of these more wild claims seems suspect to us, one thing is clear: greasy and sugary foods are as bad for your skin as they are for the rest of your body. So help give your skin the right kind of nutrients it needs to stay young, healthy, and acne-free with a diet rich in whole grains, fruits, and vegetables. Check our list of skin healthy foods where we go into a lot more detail about specific foods and their benefits. 7. Protect yourself from the sun: Ultraviolet rays from the sun can seriously irritate your skin; burning it, causing inflammation and ultimately bringing a carcinogenic risk. Yep, that means too much unprotected sun exposure puts you at a greater risk for skin cancer. But you don’t have to lock yourself indoors. Just remember to use sunscreen with an appropriate SPF whenever you spend time outside. And don’t be fooled by cloudy days or cold weather. Have you ever gotten a sunburn skiing? Exactly. UV rays are always out there so don’t forget the sunscreen! Also remember that the skin on your face is more sensitive. It’s a good idea to get a facial sunscreen and apply it daily. Look for something with an SPF around 30; all the way up to 50 if you have fair skin or live in a sunny area. Apply it at least 15-20 minutes before going into the sun so your skin can fully absorb it. Pro tip: many acne treatment creams have been found to exacerbate the negative effects of the sun. If you are using acne treatment cream, try to avoid sun during hours when it is most directly overhead (typically 10:00-2:00) and always use sunscreen or protective clothing when enjoying time in the sun. 8. Rethink your hair gel: Fragrant oils and ingredients popular in shampoos, pomades, gels, and hair oils can actually cause irritation to sensitive skin and lead to outbreaks. The oilier your hair is, the more oil ends up on your face which leads to more clogged pores and a greater chance of acne. So try to choose fragrance-free products, with quality natural and organic ingredients. Use these sparingly to minimize outbreaks, and try to keep them from touching your face. 9. Just take a couple deep breaths and relax: Stanford University published a study linking acne flare-ups with college exams. Students reported feeling more stressed out during test preparations saw an increase in breakouts. The correlation between stress and acne has been known for some time, but scientists still aren’t sure exactly why this happens. They do know that skin cells have hormone receptors. And stress produces hormones that may cause the skin to produce more oil, clogging pores, leading to pimples and breakouts. So if you are dealing with stress in your life, there’s a good chance it’s related to your outbreaks. It’s important to find a way to relax and keep a good perspective. If situations are causing extreme stress in your life, maybe take this as an opportunity to reprioritize relaxation. There are a lot of ways to beat stress, everything from talking to yourself to watching videos of cute animals. Try some different things and find out what works for you. 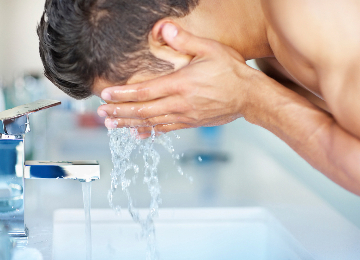 For most guys, this list is enough to help them avoid major breakouts and most acne issues. But if you’ve tried these tips and still find you need a stronger solution, we recommend making an appointment with your dermatologist to see what options are best for you. Let us know in the comments if you have any of your own secrets for fighting acne.